Currently in SO q & a when looking at a question you have related questions. Can we do something similar in Jobs such that there are two panels / divs that show related searches (after you search a key word in jobs) as well as people also searched for. The right side of the page where we feature a company has plenty of room to add this information. We recently pushed something similar out. While viewing a job listing, you will now see a "You might also like..." section in the side bar with similar jobs. 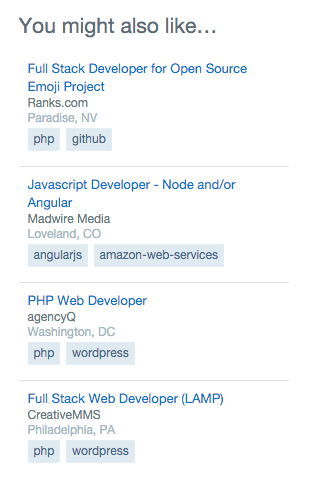 We don't have "people also searched for" and I'm not sure that we'll create that exact solution however displaying the best job matches for developers is the goal so we'll keep this in mind.